Marvel TV shows have been a bit of a mixed bag over the years and it feels even worse for those projects spearheaded by Fox given how they have the movie and TV rights for Marvel properties like the X-Men. And since Fox is the only one that can tell mutant stories, we ended up with Marvel's Agents of SHIELD obsessing over Inhumans instead. Legion is a bit of a surprise project from Fox via its FX channel to tell a more compelling mutant story. They certainly made an interesting choice in terms of their central character and that has largely defined what stories they get to explore in this show. Add in a shorter season for generally tighter writing and we are left with a rather impressive show. I don't think this show got enough attention while it was airing for one reason or another. It probably doesn't help that the titular Legion character isn't exactly a well-known member of the X-Men over the years despite his high profile origins in the comics. Thankfully we haven't see the last of this crew. 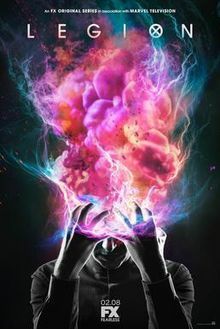 Synopsis: Legion is an American superhero TV series created by Noah Hawley for FX. The show is based on the Chris Claremont character of the same name and is tied to the X-Men movies. David Haller (Dan Stevens) is a troubled man who had been diagnosed with schizophrenia at a young age. While at a mental institution, he meets Syd (Rachel Keller), who is pretty much the girl of his dreams. The two quickly form a relationship although Rachel is reluctant to have any physical contact with other people. However eventually Syd is discharged before him and on the day she is meant to leave, disaster strikes. So it turns out that neither David nor Syd are entirely human and things go crazy because of that. In the present David is being interrogated by a government agent of some kind about what had happened. Clearly this agency knows more than it lets on and they have some pretty strong suspicions about David. In time he is rescued by another group who turn out to be with Syd somehow. The reasons for all this are established early on - David and Syd and the others in her team are mutants. And David may be one of the most powerful mutants of them all - that is if he can figure out how to gain control of his powers. What I Liked: Throughout the season the comic book fan in me kept wondering just how much of Legion's character would cross over to the show. And while a lot has made it through, it's muddled enough such that it's hard to tell really. And that's actually a great thing as this is a well thought-out show with amazing visuals and fulfilling complex narrative. With David being such a powerful telepath, his abilities actually end up shaping many parts of the show's story as well, making for a lot of clever moments. The acting talent is pretty great and I'm not just talking about how unrecognizable Dan Stevens is versus his Downton Abbey character. But special props have to go to Audrey Plaza for her role as Lenny as she is quite phenomenal! And I really loved the concept of Cary (Bill Irwin) and and Kerry Loudermilk (Amber Midthunder) as two mutants who can share a single body for some reason. It doesn't sound like a fun power but the way that they choose to present it on the show is absolutely beautiful. What Could Have Been Better: As much as I love how much of a visual maelstrom this show can be as it takes us on ever more elaborate mental journeys, it does make it a little tricky to keep up with the plot. This isn't quite a show that you can watch somewhat passively while you surf the web or have dinner. It best deserves your full attention as you try to follow all the journeys and mental excursion. The show employs the unreliable narrator device a lot and it is both a great thing and a confusing element to the show. I also feel like they got a little carried away with how many different plot points they wanted to cram into this 8-episode season. There's just so much going on with so many different people that by the end you could feel their need to speed things along and wrap things up. Hopefully the next season focuses a bit more. TL;DR: Legion is not the easiest superhero show you'll even watch but it is certainly one of the most creative and dare I say one of the boldest as well. This may save the X-Men franchise with Fox as we know it if they continue down this path. Thus the first season gets a fun 5 constructs of David's mind out of a possible 5.